Do death images have a place in body art? Do death images have a place in body art? 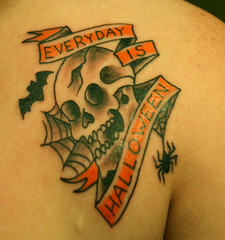 Now that we’re past Halloween and the Day of the Dead, I’d like to consider the use of death images in body art. Gang tattoos are loaded with death symbolism, in an attempt to convey power, fearlessness and the disposal of enemies. But the skull-and-crossbones motif once used to identify a pirate has long since passed into popular culture and adorns many bodies today as well. Some body art explicitly displays the destruction of other living beings. Some just conveys the threat. As the old saying goes, “You are what you eat.” To my somewhat mystical way of thinking, such toxic images would be poisonous to the soul of the wearer. I feel that body art should represent something positive to its wearer–even if that image is in honor of someone who has died. One of my tattoos is in memory of my grandmother, but it’s a bold and colorful dragon. I would not put a tombstone on my skin. What do you feel about images of death and destruction? Are they just so much ink, or does their presence affect their wearer in some way? Am I just too far over the moon? NOTE: I have closed comments on this post due to a high level of spam. Oooh. Your most recent post reminded me that I wanted to comment on this one. Essentially… I’m with Thumper. It’s not necessarily about looking tough, though that’s obviously a side effect, since images of death can be unnerving to some people. I can’t say for sure I’d never tattoo a skull on my body (if I could ever settle on a design and where to put it), but I also don’t mind keeping a few replica skulls (and real or replica bones) around in general. Part of it is “Memento Mori”, part of it is my savage Celtic tendencies (the Celts having taken heads as trophies). If I ever did get skulls tattooed, I’d probably treat them like markers of achievement, specifically for overcoming some sort of conflict, like conquering a phobia or getting rid of a bad habit. I went to Body Worlds 3, and it simultaneously tremendously unnerving and amazingly FASCINATING. Definitely not for everyone, though. Obviously my feelings on the subject are complex. 🙂 I wouldn’t have a problem looking at mummies (in fact, I eagerly look forward to the day when I can go to Egypt and see the ancient kings and queens for myself) but more recently dead people… no. When we went to my father-in-law’s funeral, the open casket was at one end of the big room and I stayed resolutely at the other end. You’re right about Dia de los Muertos, but that’s just one day. A permanent death image, on my body? Um… I don’t think so. Skulls on skin and bikes used to bother me…until it was pointed out that a skull on a bike or a helmet wasn’t there to thrust a Bad Boy image into peoples’ faces; it’s meant to symbolize the absence of the fear of death. Since then–while I wouldn’t have a skull on my skin OR my bike–I get it a little more. It means something else to other people, and I think it can only be as toxic as the intent behind it. Oh, I hadn’t thought about it that way. You’re right, that is a much more positive way to look at it. Of course, I’m the wimp who refused to go to the “Body Works” exhibit with the rest of my family because the idea of being close to dead bodies like that creeps me out. Strange point of view for someone who’s been fascinated with Ancient Egypt nearly all her life, hmm? Ugh, I didn’t want to see the Bodyworks exhibit, either. Too creepy for my tastes.